Corprat Pty Ltd is one of the fastest growing business publishing and training organisations. The company publishes products, programs and training courses targeted to both business and coaching/consultancy sectors. The main areas of specialisation include business development, lead generation, marketing, performance coaching, balanced scorecard and profit improvement tools. Prior to providing search engine Optimisation for Corprat, its web site received about 10 visitors per day and their main online marketing strategy was advertising through the Pay-Per-Click bidding on Google and Yahoo. They spent over $2,000 per month on PPC and the sales conversion was very poor. How to improve website ranking and conversion on search engines? Having been impressed by Apex Pacific’s technology and detailed Search Engine Compatibility analysis of the site, Peter Hickey ( the Managing Director of Corprat) asked us to provide a search engine marketing solution to ensure their site would rank well for regional business coaching-related searches in their target market in Australia. Our first step was to conduct keyword research into the topic of business coaching to produce a range of target ad keywords and phrases that would attract the most relevant traffic to the site. This was followed by an overhaul of existing Title and META Tags on each page, followed by extensive page copywriting to integrate new target ad keywords naturally into the site, and link building strategy to increase their Google Page Rank. Search Engine Optimisation increases the website traffic by 2000%! After 3 months of the implementation of Corprat’s search engine Optimisation campaign, Apex Pacific has achieved several top ten positions for the site across the world's most important search engines and directories. Now, Corprat’s web site attracts 200 quality visitors per day (increase by 2000%) and they have reduced their PPC spending to $500.00 per month. “With the continuing search engine Optimisation support from Apex, we will achieve more top rankings for our target ad keywords, we will likely stop our PPC campaign within 2 or 3 months when more visitors are coming to our web site from the free search ranking results.” Says Peter Hickey. Can Apex Pacific’s offer support and expertise on running a Successful SEO Campaign? Of course! Our experienced consulting team will be happy to develop an effective strategy, to help give your business a competitive advantage over your competition. After running the SEO Service for this client, they now have top ranking positions in Google for the majority of the keywords that we were targeting. They now have over 280 keywords in the top 10 position on Google, Yahoo and MSN! This has helped them to bring in many new customers without the expense of traditional advertising such as Radio or Television. 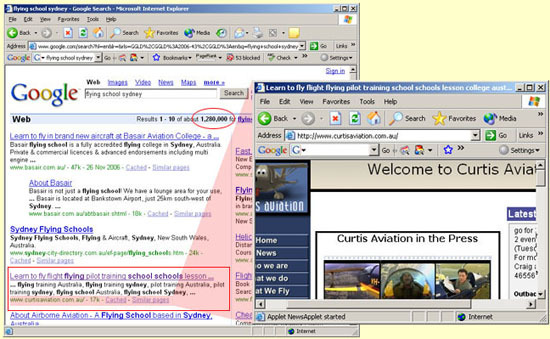 Please type the keyword "flying school sydney", there are 1,280,000 web sites competing for the same keyword. Now www.curtisaviation.com.au web site secures a #3 position, and generate more than $1,000 sales every day. Sanspot wanted to be in top pagoes Of Yahoo, MSN and Google for their website under terms specific to their business so they could attract a high rate of conversions for their shopping cart. We developed an effective keyword strategy to target ‘buying’ keywords and attract customers who were looking to purchase. As a result of targeting these keywords Sansport rapidly improved their Visitor/Conversion ratio. 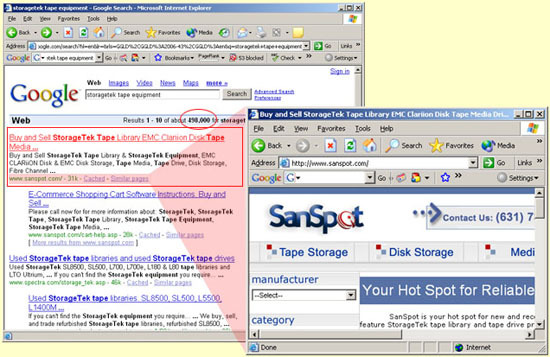 When typing "Storagetek take equipment", www.sanspot.com web site shows on #1 position on Google. Stop! If you are still burning your money on Google Adwords !! Peter spent $5,000 per month on Google Adwords before using our service. Now, his web site generate $10,000 sales per week without a cent ! After 3 months of the implementation of CorpRat’s search engine optimisation campaign, Apex Pacific has achieved several top ten positions for the site across the world's most important search engines and directories. Now, CorpRat’s web site attracts 200 quality visitors per day (increase by 2000%) and they have reduced their PPC spending from $5000 to $0 per month! 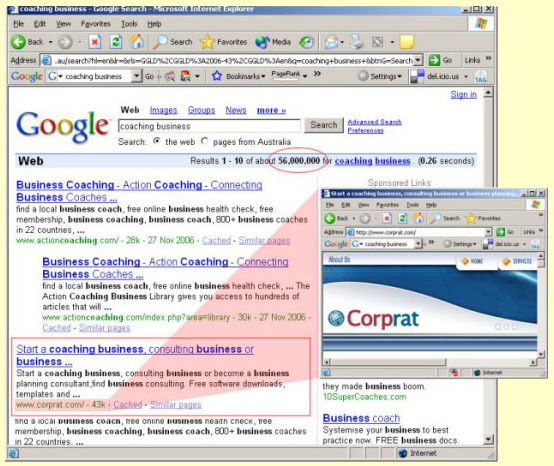 There are 56,000,000 web sites are competing the keyword "coaching business", www.corprat.com has a #3 position which converts thousands of sales every month. 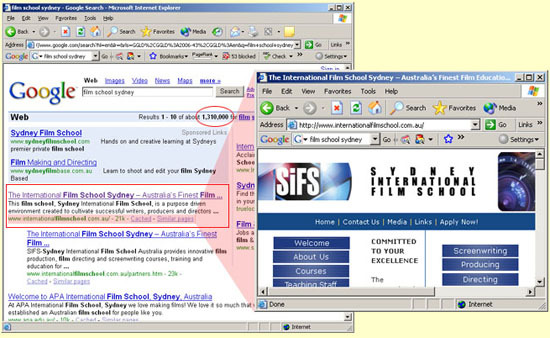 Since signing on with Apex Pacific, Sydney International Film School have top 10 ranking positions for over 50 keywords! This has allowed them to access an international market that they would not have been able to achieve by using other forms of advertising. Since commencing Search Engine optimisation they have been able to reduce their Pay Per Click budgets considerably as they were getting enough traffic through the ‘free’ search results. Some of these clients are paying just $299 per month for their internet marketing service and are now earning OVER $1000 PROFIT every single DAY! It is a return of 100%. Isotech Solutions wanted to be in the top two pages for keywords related to printer servicing. They now have 64 keywords in the top 20 position in the search engines Google, Google(uk), MSN(uk) and Yahoo(uk). How many visitors are you going to get if you have a top #3 position on Google with 6,420,000 competing web sites? Bill Small from 5 Star Warranty was looking to get the edge over his existing competitors when selling his new car warranty product. Because the websites ranking at the top of Google are generally perceived as market leaders, his brand reputation was increased and he was able to attract better clients. 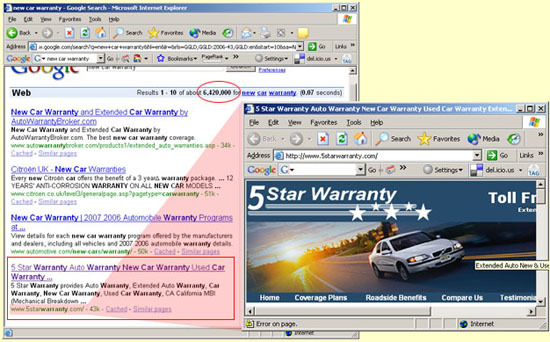 There are 6,420,000 web sites are competing the keyword "new car warranty", www.5starwarranty.com web site has a #3 position without spend a cent. © Copyright Apex Pacific Pty Ltd. All rights reserved.